Haier is best known in the US for its home appliances and air conditioners, but that is only the beginnings of what this Chinese manufacturer produces. Haier just announced the Topsir, a 9.7" ereader that has both a capacitive touchscreen and an electromagnetic stylus. Announced last week at AWE2017, the Topsir is an education-focused device with a left-handed design. Details are still scarce, but we do know that the full name translates as the "Topsir Handwriting Education electronic paper book". Topsir lives up to its name, and ships with 300 thousand exercises as well as a testing app and an education module which ties into the Dangdang Bookstore. It has palm-cancellation tech built in, enabling students to draw without marking the screen, but it is not clear whether the Topsir also has a frontlight, or what its screen resolution is. According to the announcement, the Topsir is going to retail for 2,000 yuan, or about $290 USD. Interesting.. And the price is quite nice! I always like to see more 9.7” e-readers- this market is much bigger than many people think. Jing Page X seems like a nice e-reader too. I agree. The more e-ink big-screen adoption will lower prices. 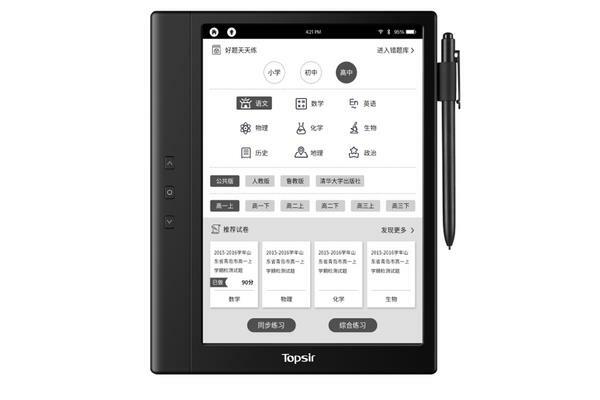 According to their announcement, the topsir e-reader is not e-ink based, but using graphene.